Black-eared Cuckoos are regarded as uncommon by many people but this is because their calls are soft and easily overlooked (listen on sound page) and they are fairly shy and tend to fly away low through the undergrowth when disturbed. 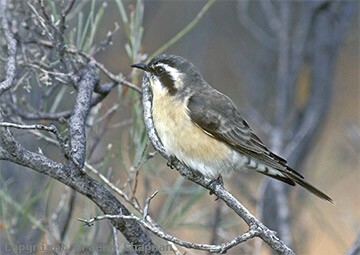 However, if you mimic their soft whistling calls they will come in readily and perch in full view. Technically, they are one of the Bronze-Cuckoos but distinctive enough not to be confused with any of the others. 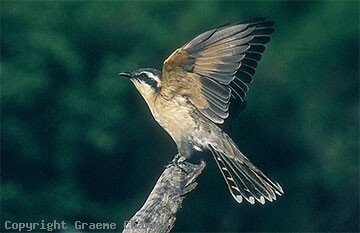 One of their calls is similar to a call given by Horsfield's Bronze-Cuckoo. It is unusual to see more than one Black-eared Cuckoo at a time - when pairs do occur together, they can call quite excitedly and some displays have been seen but so infrequently, the exact significance is not clear. (see pic#341204) I have seen courtship feeding - one Black-eared Cuckoo feeding another but because the sexes look alike you have to assume it was male feeding female because that is the norm. 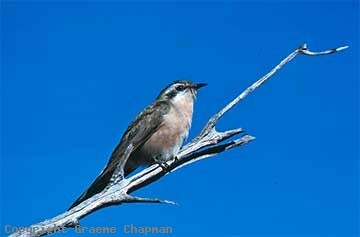 In southern Australia, they are generally regarded as being migratory but they do pop up in all sorts of places, no doubt either on migration or in response to ideal environmental conditions. Like most of our cuckoos, caterpillars figure largely in the diet. 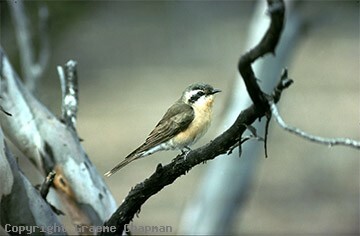 They are known to migrate as far afield as New Guinea and the Lesser Sundas and Moluccas. 341202 ... Underparts vary a lot in colour, becoming paler with wear. 341204 ... Displays are accompanied by a lot of excited calling.